Do your company's sales results lurch between highs and lows--with the end of each quarter reduced to a mad scramble to meet quota? For many sales organizations, the pattern is commonplace and unshakeable. 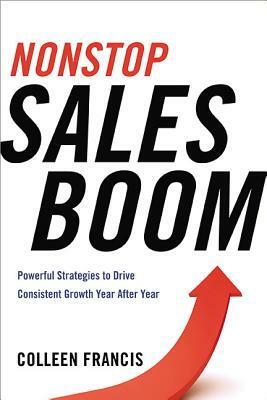 Nonstop Sales Boom explains how to break this unhealthy cycle and achieve strong, steady results--every quarter, from every member of the team. The secret is to broaden the focus from merely closing deals to actively nurturing the four critical stages of client engagement: ? Attraction: Fill the funnel with lucrative prospects ? Participation: Turn them into customers faster ? Growth: Invest in valued clients ? Leverage: Turn customers into referral generators When companies concentrate on only one or two of these areas, their results become erratic. With the field-tested strategies in Nonstop Sales Boom, readers will learn how to systematically attract a regular flow of prospects and move them smoothly through the pipeline. Packed with enlightening examples of sales disasters and standouts, this practical guide brings balance to the selling process, reliability to revenues, and booming sales all year long. COLLEEN FRANCIS is President and Founder of Engage Selling Solutions. Selected as a 2013 Top Sales Influencer by Openview Sales Lab, Colleen is known for delivering results. Her clients include Merck, Hilton, Chevron, Royal Bank of Canada, Dow AgroSciences, Adecco, Trend Micro, and countless other leading organizations.